READY TO DO THE LIGHT THINGS YOUR WAY? 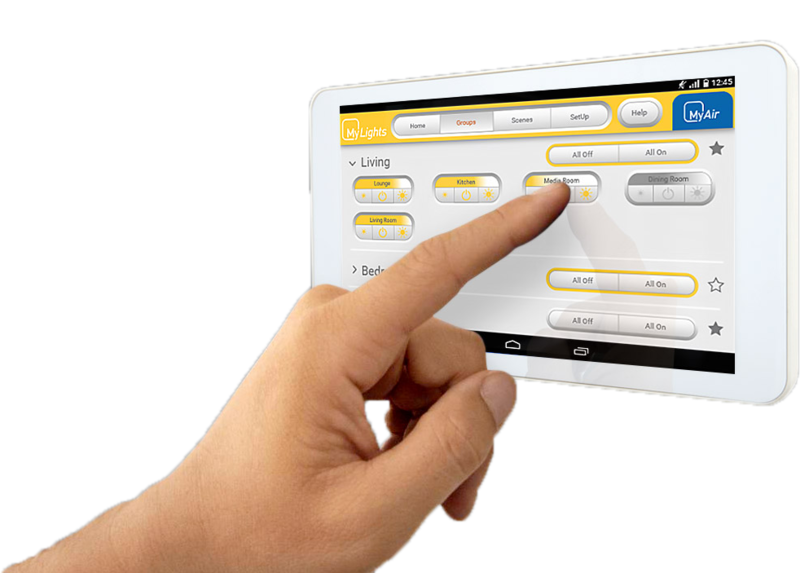 The MyLights touchscreen control panel was purposely built to be able to effortlessly integrate with other Advantage Air technologies, such as our MyAir air conditioning system, so that you can control your home lighting and your aircon from one central hub. With Advantage Air’s MyLights technology, connecting your home with smart systems are no longer considered a luxury. MyLights will cost you significantly less than other smart home systems that are available on the market today. What’s more, MyLights is incredibly energy efficient, saving you money despite the neverending Eskom tariff increases. Want to stop fumbling for your keys in the dark when you get home from work, or wondering what that noise is near the bushes? With Mylights you can walk into a brightly lit home by turning your lights on remotely from your car. With MyLights you can take comfort in being able to control your home lighting system from any location, so that if you are on holiday or out of the house for an extended period of time, it can look like you are still home from the outside. And don’t worry about energy consumption, with MyLights LED halogen lights, you are already saving up to 80% on your energy bill. Unlike some new technologies which require a comprehensive user manual, MyLights is incredibly intuitive. You won’t need a tech expert to help you set up the system, you will be able to do it all yourself. Between the 8-inch MyPlace control hub and the downloadable smartphone and tablet app, you can control your lighting system remotely from any location. If that’s not user friendly then we don’t know what is! Setting the mood in your home with MyLights. Turn down the lights to transform your bathroom into a spa retreat or dim your dining table overheads to create a cosy dinner party. MyLights can also be used for your backyard and outdoor living spaces, with light brightness being completely adjustable with a simple to use scale. Are you in the process of a new home build? MyLights can be easily installed when homes are in the construction process. If you are building a two storey home however, MyLights must be installed prior to the second floors slab being laid.